We all know about the benefits of solar power and research into new materials, devices, and the associated fundamental physics, continues apace. JPCM has recently published a special issue on the theory of materials for solar energy conversion. Theory being the key word here: no actual photons were harmed in the making of this issue. All this talk of solar energy got us thinking about sunshine hours – it feels like we haven’t had a proper sunny day here in Bristol for weeks. The map here shows average yearly world sunshine hours. Southern Spain tends to get twice the number of sunshine hours as the UK. No wonder we are always complaining about the weather. Luckily, solar panels still work in cloudy weather generating between about 10-25% as much energy as in full sunshine. Featured image: Image by David Goehring published under a CC BY 2.0 license. 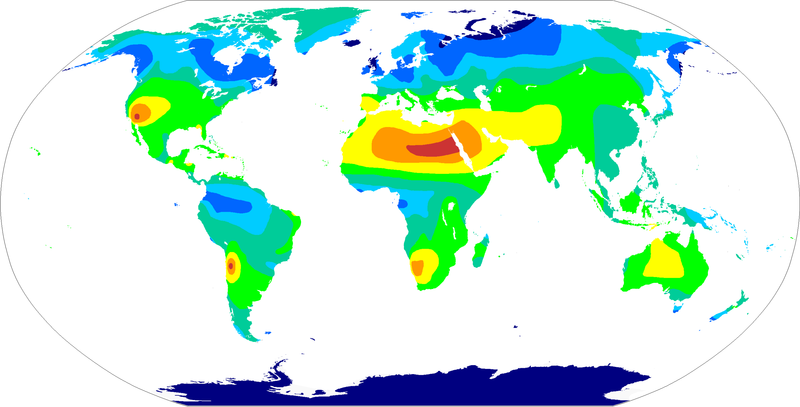 Map of yearly sunshine hours in the world. Credit: Landsberg, H. E. in Pinna, M. L’atmosfera e il clima, Torino, UTET, 1978, p. 63.